I’ve been a fan of Kenwood for decades. The vineyard has a history of producing wine that offers an excellent ratio of price to quality. Whether it’s their white wines such as Sauvignon Blanc (about $11) or Pinot Gris (about ($16) that are multiple “Oyster Award” winners, or their entry label reds, their wines offer taste and value. 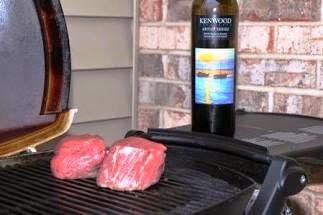 And like other “wineries within a winery,” Kenwood offers various label options in which both quality and price rise. They do this through various series called “Vintage”, “Sonoma”, “Reserve”, “Jack London” and “Artist”, the latter offering Cabernet Sauvignon only. 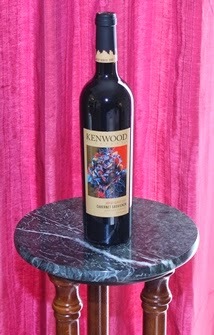 I recently tasted Kenwood’s 2010 “Artist Series” which is a blend of 96% Cabernet Sauvignon and 4% Merlot. No Petit Verdot, no Cabernet Franc, this a wine for lovers of Cabernet Sauvignon. But it’s gotten so (for me) that I don’t know who that includes anymore. All too often, I find many “new world” Cabernet Sauvignons somewhat one dimensional. Yes tannin. Yes cassis. But lacking in balance and depth: too jammy, all black fruit, it becomes a wine that pushes forward one characteristic at the expense of all others. Gone is the subtly, complexity and depth; the ménage of flavor that intrigues and entices. A taste of the 2010 “Artist Series” however, entices and intrigues (as have other years of the series I have tasted). Deep purple in the glass, it offers a nose of blueberry and cedar that carries into the taste with cassis and black cherry. A fellow taster described the spice as that in “mincemeat pie.” I tasted allspice and a hint of cinnamon. I think we said the same thing though I liked his description better. The mouth feel is rich and silky to the extent of being luxurious. The fruit is super ripe, but not jammy. Flavors are deep with dark fruit balanced subtly against tannins that are reserved but developed in the back taste. This is a wine that both pushes and pulls. It has dense, deep flavors, but none of which dominate the senses to the exclusion of other characteristics. Its depth and balance are so intertwined they make it a wine that is challenging to describe but that is its beauty. It’s a complicated wine but one that is so easy to appreciate if you don‘t have to write about it. Fruit for this wine is sourced 55% from Sonoma Valley, 41% Alexander Valley and 4% (the Merlot) from Dry Creek Valley, allowing the winemaker to adapt percentages as needed so as to develop the wine’s best expression. After more than two years of barrel aging, the winemakers taste the individual vineyard lots and select barrel by barrel the most flavorful wines to make up the “Artist Series” blend. Aptly named, the “Artist Series” reflects the art of winemaking. Care in the making of this wine is evidenced by its juice aging for 26 months in French oak with the wine, after bottling, benefiting from an additional 18 months of bottle aging before release. With all this care and nurturing, the 2010 “Artist Series” is drinkable now though it will continue to develop better over the next ten years with proper cellaring. so I displayed a 2007 "Artist Series"
you would wish you could. This is an experience, however, you should not miss and will provide you with more experience per dollar than many pricier cabs grown on vines in other counties of even pricier real estate. Value is evident after tasting. Follow and “like” Wine Mizer on Facebook for mini reviews, fun facts, recipes and more. * The “Oyster Award” is presented annually through the Pacific Coast Oyster Wine Competition. The ten best West Coast wines that go with oysters on the half shell are awarded. ** 2010 sample provided by publicist for review.